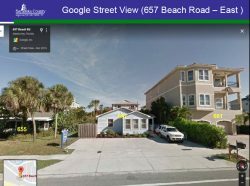 It took only about 16 minutes on April 24 for three members of the Sarasota County Commission to approve a new three-story, two-dwelling house built on pilings in the footprint of a 1930s structure at 657 Beach Road on Siesta Key. The house will be on the landward side of the road. The lone “No” vote was cast by Commissioner Alan Maio, who represents the barrier island as part of District 4. He did not offer any comments about his decision. Chair Nancy Detert did not attend the afternoon session of the board’s regular meeting in Sarasota. Vice Chair Charles Hines said at the opening of the session that she was felling unwell and had headed home. The house will be a maximum of 20.5 feet seaward of the county’s Gulf Beach Setback Line (GBSL), which is the figurative “line in the sand” the county uses to protect property on its barrier islands from storm damage. During the public hearing regarding the petition for a Coastal Setback Variance (CSV) for the project, only one person voiced concern. 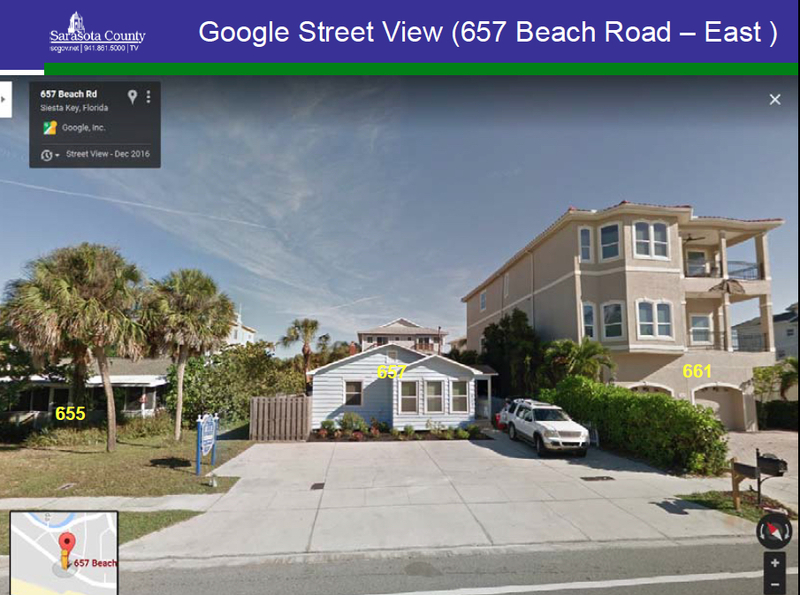 Lisa Coleman told the commissioners that her home next-door to the property “is a small 1930s, really, truly authentic Old Florida beach cottage” that has been in her family for generations. She was worried, she said, about how the elevation of the new structure would affect potential storm surge on her land. 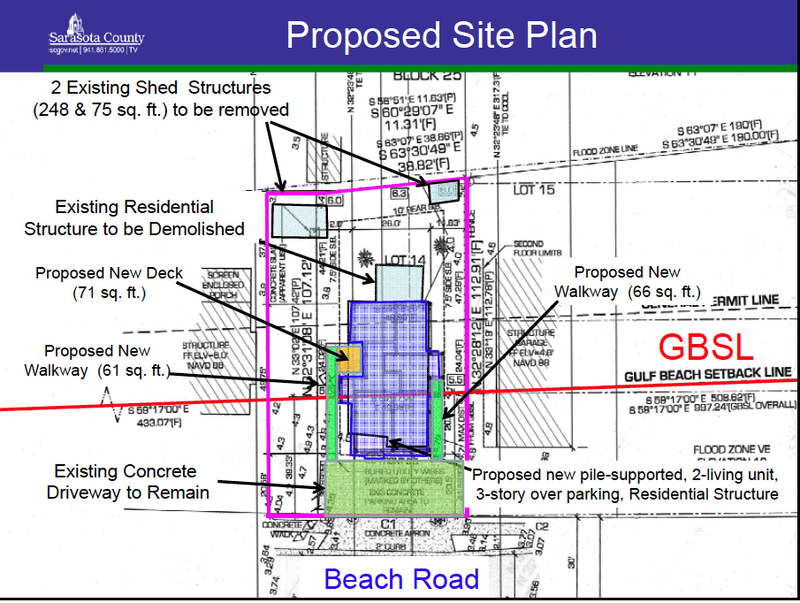 Weiqi Lin of the county’s Environmental Permitting Division had explained earlier that 169 cubic yards of fill would be brought onto the 657 Beach Road parcel in advance of the new construction. “The flooding is constantly an issue for the area,” he noted during his presentation to the commission. Additionally, she said, because the new house will be 20.5 feet seaward of the GBSL, she is worried that it will block her view toward the public beach, as well as the breezes, which she enjoys while sitting on her screened porch. Hines asked that she speak with Matt Osterhoudt, director of the county’s Planning and Development Services Department, who was seated in the audience. Osterhoudt could answer her questions about stormwater issues related to the new construction, Hines told her. Edward Eible, president of the Architura planning and design firm in Sarasota, also addressed the board. “Any new construction [on Siesta Key] has to [conform to] the current [building] code.” His firm has been working on the project at 657 Beach Road, he said. Federal Emergency Management Agency (FEMA) regulations require that any new construction in a flood zone be raised a certain level above the ground to protect against storm surge damage, county staff has explained. A staff memo provided to the board in advance of the April 24 meeting says the first habitable floor of the new structure will be “18.3 feet NAVD” to comply with the 100-year storm elevation requirements. Commissioner Paul Caragiulo thanked Eible for making his statement part of the public hearing record. During his presentation, Lin explained that not only would the existing 1936 single-family residence on the site be demolished, but two sheds also will be taken down. The new house will comprise 4,469 square feet, he added. 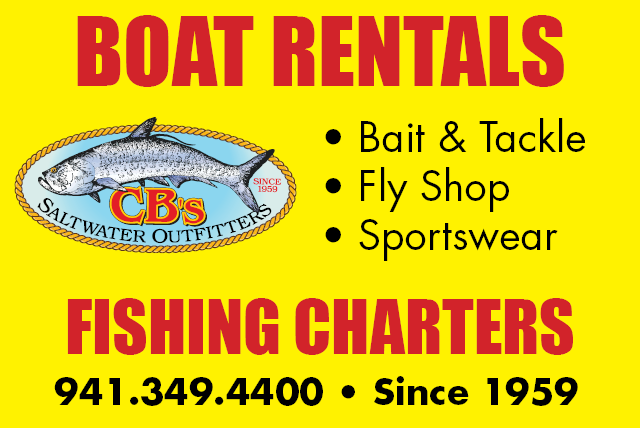 The staff memo provided to the board in advance of the April 24 meeting says that of the habitable area, 1,545 square feet will be seaward of the GBSL. The existing concrete driveway, which is 41 feet seaward of the GBLSL, will remain, Lin noted. In 2000, he continued, the owner of the adjacent property at 661 Beach Road received County Commission approval to build a new two-story house over parking. The design also calls for a new walkway comprising 191 square feet and a new 71-square-foot deck, the staff memo points out. The total impervious area — including the building coverage of 1,368 square feet — will be 2,572 square feet, the staff memo notes, which is 48.78% of the lot size. “The Zoning Administrator has reviewed this parameter and confirmed it is consistent with the lot coverage limitations required by the Siesta Key Overlay District (SKOD),” which governs zoning on the island, the memo says. Lin further pointed out that the house would be 779 feet landward of the Mean High Water Line. “The beach accreted fairly quickly over the past decade [in that area],” he added. “The [Florida Department of Environmental Protection’s] August 2016 report Critically Eroded Beaches in Florida did not designate this area of the beach as critically eroded,” the staff memo says. Following the public hearing, Commissioner Caragiulo made the motion to approve the Coastal Setback Variance, and Commissioner Michael Moran seconded it. Commissioner Hines initially thought Commissioner Maio had voted “Yes,” but Maio clarified that he was opposing the variance.